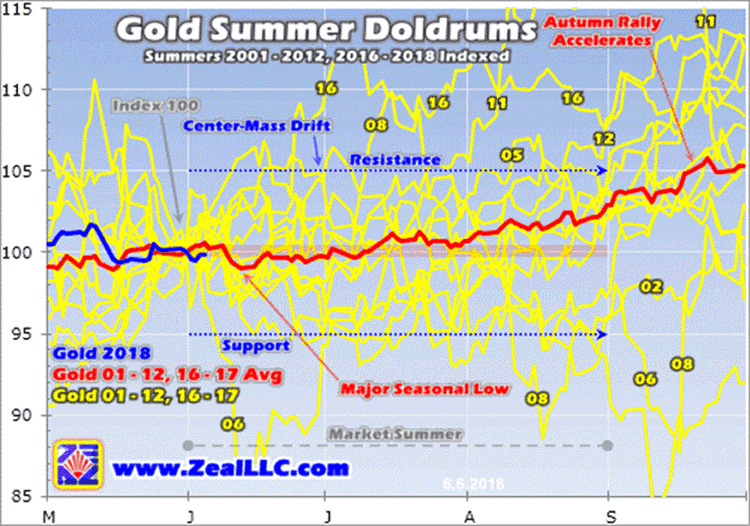 While there are outlier years, gold generally drifts listlessly in the summer doldrums much like a sailing ship trapped near the equator. The center-mass drift trend is crystal-clear in this chart. The vast majority of the time in June, July, and August, gold simply meanders between 5% from May’s final close. This year that equates to a probable summer range between $1233 and $1363. Gold tends to stay well within trend. 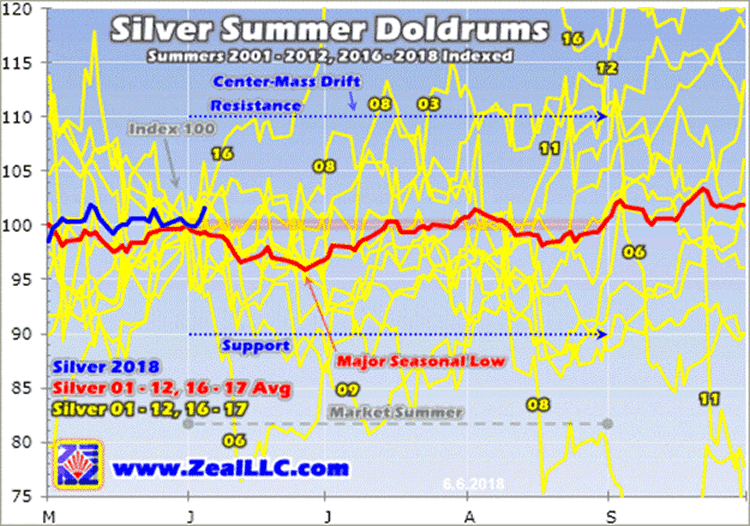 Since silver is much more volatile than gold, naturally its summer-doldrums-drift trading range is wider. The great majority of the time, silver meanders between 10% from its final May close. That came in at $16.39 this year, implying a summer-2018 silver trading range between $14.75 and $18.03. While silver suffered that extreme June-2006 selling anomaly too, its major seasonal low arrives a couple weeks after gold’s. The gold miners’ stocks share silver’s center-mass summer drift running 10% from May’s close. 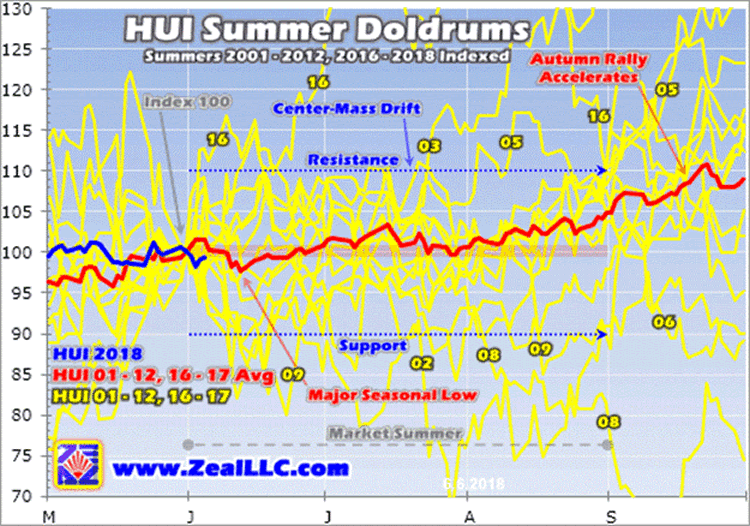 This year the HUI entered the summer doldrums at 180.1, implying a June, July, and August trading range of 162.1 to 198.1. While gold stocks’ GDX ETF is too new to do long-term seasonal analysis, in GDX terms this summer range translates to $20.11 to $24.57 this year. That’s based off a May 31st close of $22.34. The Fed is universally expected to hike rates for the 7th time in this cycle on June 13th. That is one of the every-other FOMC meetings also accompanied by the newest dot-plot federal-funds-rate forecast by top Fed officials. And afterwards the Fed’s new chairman Jerome Powell will hold a press conference. If any of this is less hawkish on more rate hikes than traders expect, speculators could aggressively buy gold futures.